Snap off and discard the ends of the asparagus, and cut the rest of the stalks diagonally into roughly 2.5cm pieces. Finely slice the ginger, garlic and spring onions. Thoroughly wash the scallops under cold running water. Place in a small bowl or ramekin, add the cornflour and, using your hands, gently massage it into the scallops until well combined. Mix the sauce ingredients together in a separate bowl or ramekin. 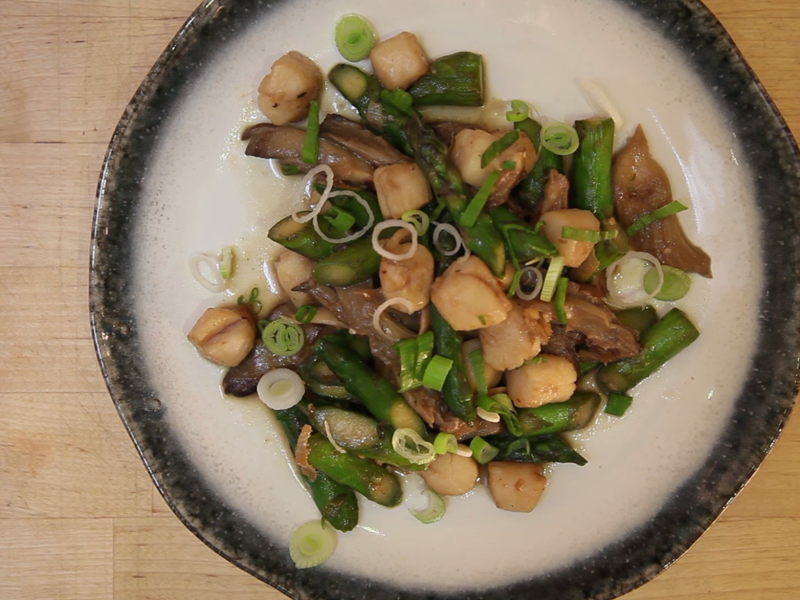 BUILD YOUR WOK CLOCK: place your chopped asparagus at 12 o’clock, then arrange the ginger, garlic, scallop bowl, spring onion and sauce bowl clockwise around your plate. Heat 1 Tbsp. of vegetable oil in a wok over a high heat until smoking-hot. Add the ginger and garlic and stir-fry for 30 seconds until slightly softened, then add the asparagus and stir-fry for a further 2 minutes, until the asparagus is just tender and lightly coloured, add the mushrooms and cook for a couple more minutes. Transfer the ingredients from the wok to a bowl, add a further 1 Tbsp. of oil to the wok and return to smoking point. Add the scallops and stir-fry for 1 minute, until browned on all sides. Return the vegetables to the wok, pour over the sauce and bring to a vigorous boil. Cook for a further 30 seconds, until the sauce is silky-smooth and just beginning to coat the scallops. Transfer to a large dish, scatter over the spring onion and serve.